I have a 1983 pantera with I'd # ending in 9245. How can I make sure its an original gt5? #9245 is certainly of the right era to be a GT5 for one. Peter Havlik (user: Peter H) holds the late model registry and might have contact with Claudia Lodi who may still have access to the post Ford factory records. Good luck and a warm welcome. I only have an outdated copy of Peter's registry with me, and I'm travelling, but this car doesn't appear in the version from 17 years ago, which is the only version I have with me. I've sent Peter an e-mail, and expect him to chime in soon. If it isn't in his registry he'll be happy to chime in with what he knows and be able to include the car as "found", but it doesn't help Jackie with his problem. I could be mistaken, but didn't Roland end up with all the factory paperwork? As far as I know, the factory paperwork would be the only way to know 100% if the car was an original GT5, but I'd say that if it looks like a GT5 now, then the probability of it being "authentic" is high. In the early 80's the factory was in full swing producing GT5 cars, and a glance at Peter's registry shows that probably 90% of the cars produced in the early 80's were GT5 cars (as opposed to GTS, the only other option). There were a few oddball GTS cars built, but they were all made to customer order so it would be unlikely for someone to order a narrow body car and subsequently convert it to wide-body. Anything is possible, but the vast, vast majority of cars from that era were GT5 cars. What would an original gt5 be worth? Does anyone know if the riveted flares were made of fiberglass or metal? Here are some pics of the car. http://imageevent.com/cobraman...sessionid=t3lujcpr43. The GT5 flares are fiberglass from the factory. Having seen the photos I would have little doubt this is an original GT5 and one in very nice condition. The delta wing would appear to have been raised and angled over original position. As for value; in this market a car is worth what someone is willing to pay and you'll likely get different opinions. Personally I'd hazard a guess at low value $57.5K, high value $70K and expect that you should target $65K if considering selling. That is without knowing the engine or transaxle history/mods. I have Peter's list. It goes from 9242 to 9250 (both in or from Australia). No 9245. The car sure looks like a legit GT5. The chassis and engine numbers are correct. The wheels and mirrors are not original and there appear to be a few other mods. I'd say $65k is a low number for a GT5 - of which there are but 110 left of 250 built. As Joules indicates, the condition it's in will make for the range. If those pictures are current and it has already been gone thru and is roadworthy and updated it will be worth quite a bit more. I know of a few 'stock' GT5's that have gone for $90k+. Each of the new owners then spent heavily on them. Thank you very much. It makes sense that it is probably from Australia since the VIN # starts with THPNAU. I was thinking of selling it, but was unsure of what range it would be in. The car is in very good condition, roadworthy and super fast. I've owned it since 2001 but didn't find out about this forum until now that I thought about selling it. Well, maybe now that you found this forum you should look up some of the other Pantera owners in FL. I see many of them posting on this board. To get the most out of Pantera ownership there's nothing like blasting around with other cats! I have little to add to what Julian, Charlie, & David have already written here. In short, it is highly likely that your car is a genuine GT5 but, as Charlie writes above, short of confirmation from the factory, there can be no absolute certainty. If you PM me, we can discuss sending a request to Claudia Lodi who, although she no longer works at De Tomaso, has been known to very generously volunteer occasional help. Just one point about the issue of whether this car is from Australia. While it is true that the Panteras on either side of yours in the registry, as ordered by VIN, are from Down Under, this should not be taken as determinative. There is only the loosest occasional correlation, and usually none at all, between VINs and where the cars were shipped by the factory. It should also be noted that all cars originally imported into Australia were, to the best of my knowledge, all right hand drive. 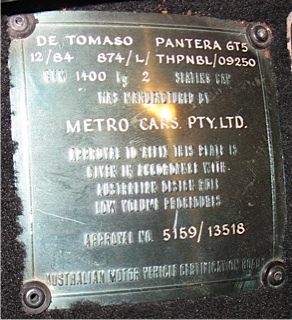 They also all have a distinctive importation plate in the front trunk (see sample below). I would be very surprised if your Pantera had any connection to Australia. Your car looks fantastic!! What part of Florida are you in? I am sitting here in Cape Coral near Ft. Myers with 2 cats and I have come to find that there are several others in the area, one of which just showed up on E-bay. I live in NC now, but the car is in Miami, FL. A couple of years we were on our way to Captina and ran into a Pantera on the street and, of course, my husband had to chase the guy down. I wonder if that was you? That would be too funny. Well since the person was in question of how much the car was worth,they have it listed. How do you get in touch with Claudia Lodi to get factory information? I know this post is now old, but I have a 1984 GT5 and I am also keen to see what factory information may have been stored about this car and its original specs? My car is very original and 17,00 miles, but over that many years small things may have been changed and I am keen to know what and if it has? Nice looking car. I like the red with the interior color... is that champagne or cream? The video was uploaded to Youtube in 2011.